Take the modern China as an example, its status quo of society accords with the descriptions accurately, 50% urbanization rate is far below saturation point and thus, enormous vacancy exists for half billion people converting their identity from farmer to worker. Due to the regional revenue discrepancy and family-gathering tradition, the largest scale human transmigrant tide in history is happening annually during Chinese Spring Festival. Together with the property right redistribution and reform brought by IT companies such as Airbnb or Uber, the world is turning into a deeper degree at liquid modernity for a certainty. Meanwhile, architects in this era should cease being tools for capitals or utilizing architecture as a shelter or bastion for solidification against fluidity. Based on these accounts I experiment some approaches to the methodology in liquid modernity context. 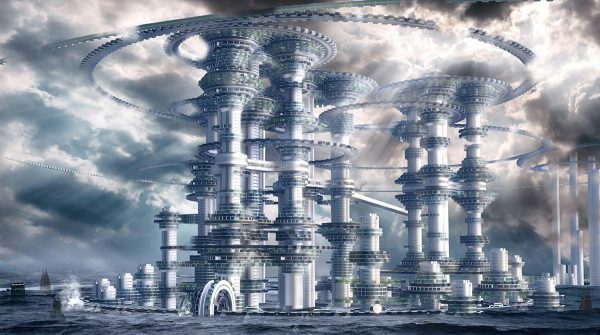 I myself consider the Cog-Polis a straightforward, polarized substantiation of liquid modernity society, rather than the seeming doomsday apocalypse or mechanical punk mania. What I want to reveal is the metamorphosis of society after the ultimate sharing economy reform and property redistribution. 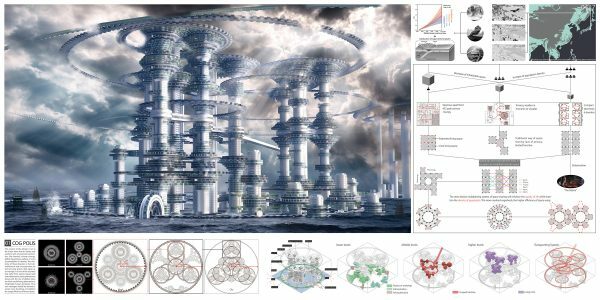 Using gear set mechanism and optimum solution algorithms, the dwellers in this cog city live a dynamic life with constantly changing backgrounds, company, and activities. They can drift on this nomadism life cycle purposelessly or, they can arrange every detail of their schedule rigorously with the help of AI, which will supplant the role of government unconsciously in the future. 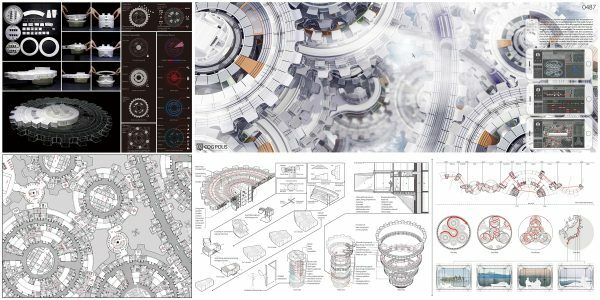 It is the fluidity that emancipates the solidifying vacancy and multiplexes active space for people, and it is the architectural strategy that implements the sufficient fluidity. With this chimerical background, I can eliminate wealth disparities by the force of catastrophes and reallocate properties share compulsively. But in actuality, the social fluidity streams horizontally while the vertical social ladders are diminishing and class differentiation is escalating. So the architectural progress in liquid modernity turns difficult to achieve. The enlightenment from other Interdisciplinary subject—in this case, mechanics—will be urgently needed, eVolo competition provides a perfect platform for the inspirations from various angles to fuse and conflate; I believe the Cog-Polis rhapsody together with other participant proposals will truly indicate some approaches to the worldwide social and environmental issues.